The two filters that can be directly compared are the A120 and the STG, they are both 4 pole, 24dB slope ladder filters. Ladder filters copy the classic “moog filter” (electronically speaking) so they have a very definite cut , a really fast response to modulations and oscillates at full resonance generating a sine wave. The DOEPFER A120 was concived as the classic moog emulator but it doesn’t sound moogish at all, it is very clear and have a minimal touch to the sound, it lacks the organic carachter of the ladder moog, but it’s perfect for other tasks as aggressive minimal sounds or percussions. The STG LPF emulates the ARP 2600 filter “post lawsuit” (the one used after the legal problems with R.Moog). I tried this filter face to face with the original and it is quite similar but not the same, but it retains the warmth and power. The only downfall of this filter is a kind of bleed you can hear as the resonance increase, not very pleasant but all in all tolerable. This filter has 2 freq inputs and 2 signal inputs all without attenuators, 1 amount input and a audio output. 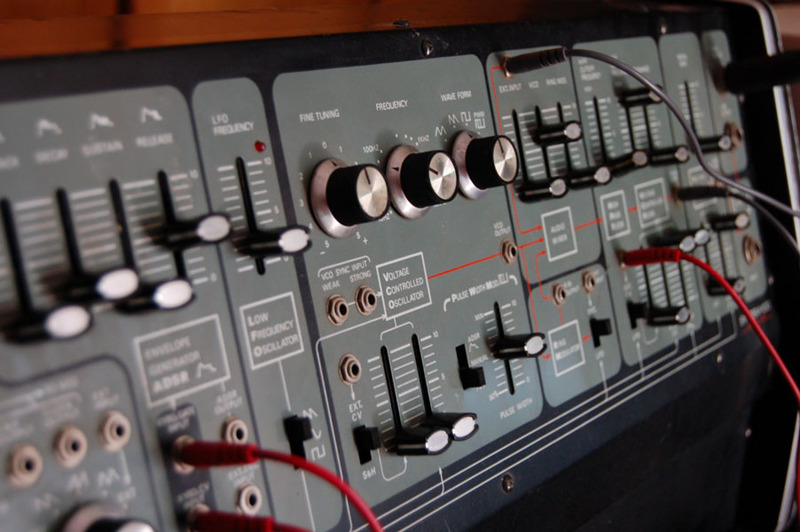 The Analogue Solutions SY02 was dsigned as a Korg MS 20 filters and vca clone. It consist of a highpass + lowpass filters both with resonance and amount and a vca. The sound is raw and the filter can distort easy, this module is used even in the Vostok and Black Coffee . The fourth filter is the Analog Systems RS500e, a diode filter with 18dB and 24dB slope clone of the classic EMS VCS3 and AKS Synthi (pre and post 1974). This filter has the classic frequency, amount and response (resonance) controls plus a level in and level out (to get a kind of overdrive sound) and a cv slew (fast or standard), a mod that was usually done on the original synthi. The first set of demo is based on arpeggio and bass sounds as they show the behaviour of the filters in simple sounds. I’m a great fan of the Korg MS-20, as it’s one of my favourite synths ever, so I decided to expand my modular with an MS-20 filter clone. I like the Borg but it works only as a multimode filter that can out put only one signal, so it’s quite limited. The Doepfer is interesting but I found the ASOL the more versatile and at the same time interesting as carachter. The first thing to say that THIS IS NOT THE MS-20 FILTER! In its way it can have common caracteristics and sounds very similar but it’s not the same. 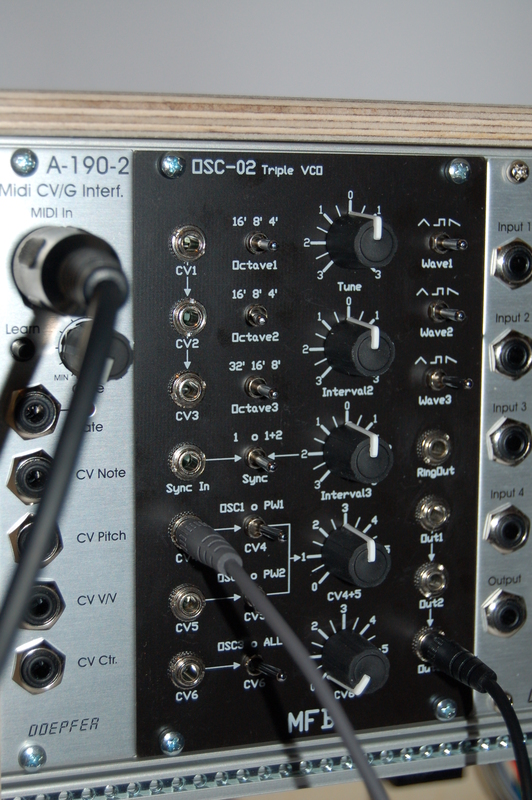 The module has a vertical row of connections for CVand audio INs on the left and the knobs on the right. There is a an INPUT LEVEL to adjust the gain for the incoming sounds, that useful to saturate or lead the filters to overdrive. On the left there are 2 AUDIO IN . The HPF CV has 2 CV in the first is attenuated by the knob while the second has no attenuation control. As for the HPF even the LPF filter has 2 cv in and only the first is attenuated by the LPF CV. The VCA has its 2 CV IN not attenuated. This module is the FILTER/VCA section usedon the Analogue Solutions VOSTOK too, the construction is solid and the VCA it’s a really good add o this filter. The filters have a really particular response , tryng to emulate the Korg MS-20 filters/VCA, and the input gain is the key to get smooth sounds or enter in noise territory. I’ve patched the synth in a very simple way to understand clearly the behaviour of this module. I’ve patched only the first vco (from my MFB OSC02) directly into the first audio in of the sy02, used the MFB Dual ADSR to control the vca ancd the LPF. With a low input level the sound is really mellow and “japanese”, smooth and deep. As I turn the input level clockwise, the waveform gain in volume and in saturation until “distortion”. Distorion is like a good overdriven sound , not a clear distortion. As the filter , with a low input level flows into the filters they react quite smoothly and the resonance has a pleasant harmonic sound but reaches only little aggressive tones. As the input level grows the filters start to saturate and overdrive the sound, and using ring mod with saw sources it creates a particular clipping , like if it would cut and drive the peaks of the saw waves. A really interesting trick that every MS-20 user knows is using the HPF as a frequency booster. In fact the resonance of the HPF can produce a really big amount of sub frequencies usable to fatten up the sound. If the HPF is controlled with the tracking of the keyboard it can create very powerful SUB basses. Behond the FILTERS there’s a good (in my opinion) VCA that concurs to give a strong carachter to the module. The VCA does not ave a superfast response or a extra dynamic behaviour, but it’s very warm and full, really musical! For me it’s very important for a module to be “musical” because too often a modular synth can do amazing noises but cannot play a bass sound , and that’s quite absurd. 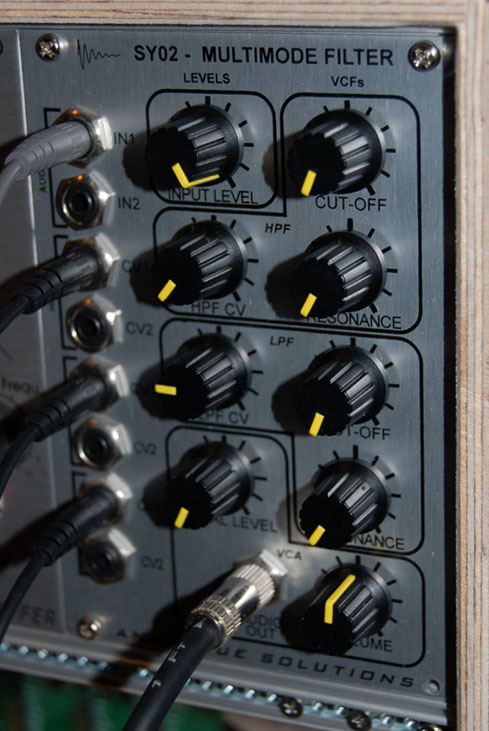 Doepfer modules (like the A-132-3 DVCA I own) have a cleaner sound and more volume but are less musical (in my opinion but maybe you will like it), and I find this useful for percussive sounds or effects and less pleasant for melodic sounds. Back to the SY02 , I’m really happy with this module, it has a certain retrò/MS-20 touch, but it also has a carachter of its own. I really recommend it to everyone looking for a japanese touch in his modular sounds! Yesterday I tested the MFB VCO and the MFB Dual ADSR with my Roland System100 mod 102, during the test I did some demo recordings. The demos are quite long and in every demo I used the same “sequence” and tweaked the knobs to let you hear the behaviour of the system. As the melody is quite redundant I hope you don’t get annoyed and focalize your attenction on the sounds. The MFB VCO (only one vco) passes trhu the Roland System100 filter. First I use a saw wave then a square without any modulation and play with the filter to show as the the two modules interact. The MFB VCO pass thru the Roland filter and the MFB env modulates the Roland filter cutoff. It starsts with a saw wave , than at 1’30 I switch to the PWM and continue playing with the filter and with the MFB env. Here’s a comparison between the two vco passing thru the Roland System100. When you listen to the sound keep the volume at a fixed level, don’t turn up the volume when some sounds seem more quiet because there are some resonance peaks that can DAMAGE your speakers and your EARS! The Korgs work well altogether as they use the same korg “standars” as 1/4″ plugs, hz/volt , etc. The system is well balanced and is very versatile , there are no tuning problems and connections between one module and the other has no need of attenuators and result open to every use. 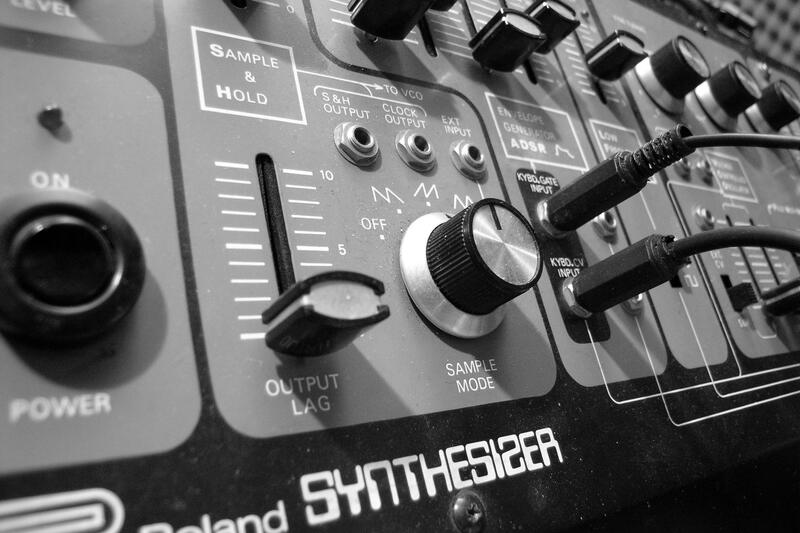 The Roland System 100 is quite different, it uses 3,5mm plugs, 1volt/oct and is quite difficult to make it interact with the Korgs even because the sound of the Roland is “stronger”. After analizing different solutions (the first was to buy the other parts : mod 101 the keyboard, the sequencer and the mixer, while the second was to buy a System100m…) I decided to buy an eurorack to have a synth easier to control with computers and midi devices , more stability and however the freedom to build a synth choosing every part. The result is, as I described, a synth with basic elements that are quite different from the “new analog” I own (DSI Evolver desktop and Studio Electronics ATC1 and SE1), but quite versaatile for a wide range of sound including FM modulations. The first thing I tried is the interfacing between the Eurorack and the Roland and I was surprised they interact very well . The Midi-CV interface works very well with the System100 too (I use a Kenton Pro 2000 for it, usually..). The first thing I tried was to compare the Roland VCO with the MFB VCOs and I was quite surprised. The Roland is really thick on the lower frequencies, and the square waves are awesome , but the MFB is really good too and they have a similar sound in many ways. The MFB is less deep , especially when you hear in A->B comparison , and a little darker on the highest frequencies, but does a really a well job fattening the System100 sound without sounding different. What makes the BIG difference is the Roland Filter. Using only the MFB VCO in the roland path , with the roland VCO with zero volume, the result is amazing. The VCO sound smooth and rich, really fat on the lower range and really harmonic and “creamy” in the higher register. The big difference is evident in the lead sounds, they sound smooth with big carachter and warm sound without being harsh or disturbing but always rich of mid and high harmonics. As the resonance grows the sound became quite acid (the typical roland filter carachter) but with growing harmonics, and a massive warm sound. Then I tried to use the MFB dual ADSR to compare the behaviour of the two type of env and even here the different is evident.The Roland one is FAST and SNAPPY but always “rounded”, more musical, and gives the synth the classic Roland touch. The MFB ENV is really fast, maybe faster than the Roland, but also more angular, with the attacks at zero makes a “ping” sound at the trig of the note. Maybe the voltage that this env produce is higher and should be attenuated to get more musical results, even if the different behaviour is really interesting to get different result. The first thing done was a sequenced upright bass that sounded really awesome. I did the same sound using only the eurorack and the sound was similar but more enarmonic, the reason is without any doubt the different between the two filters. MFB Berlin started with simples and cheap drum machines and the Synth-lite, a DCO based Moog Prodigy clone. 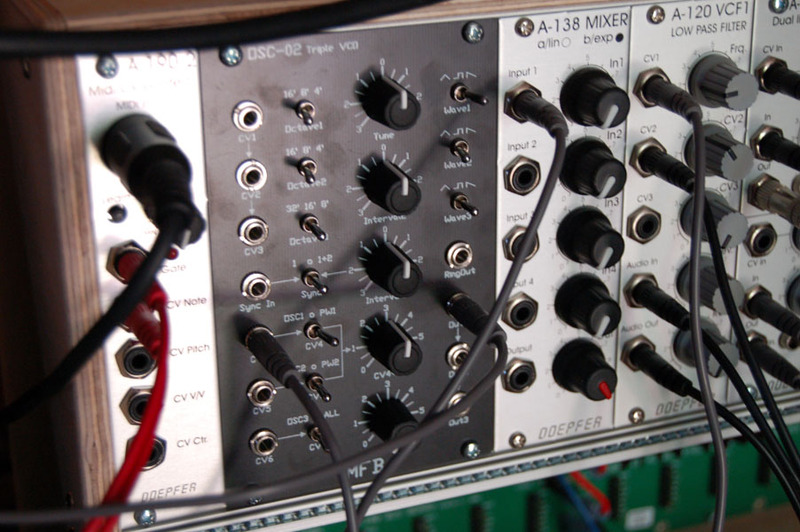 With the Eurorack explosion MFB started producing modules derived from their synths and drums. The latest creations are the semimodular synth Kraftzwerkg and his brother Schlagzwerg, a semimodular drumcomputer. 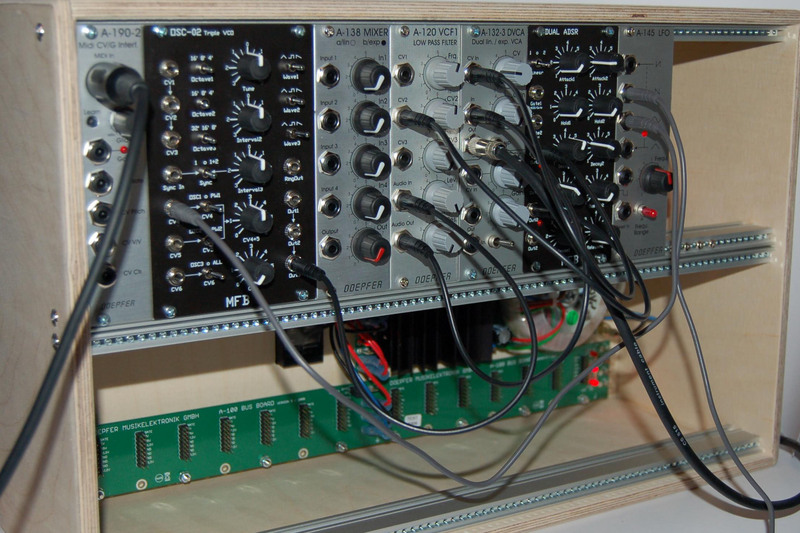 MFB built this two semimodular using the modules they produce in eurorack. 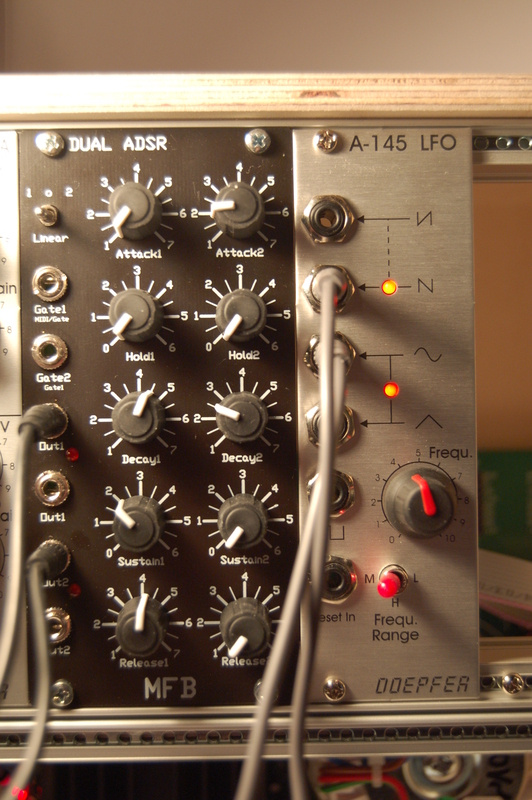 First this module is not a classic ADSR but an AHDSR, in fact after the attack there is a HOLD! The HOLD is really useful for “sequencer sounds”, you can turn every knob to 1 and just use the hold to control the duration of the sound. It can be useful also for a smoother change between the attack and the decay curves to get a rounded tones. The Dual Env is an EXPONENTIAL ENVELOPE, but has a switch wich let you decide if one of the two can act in LINEAR mode. When the env act in linear mode even the hold changes its behaviour shaping the sound in a more “angular” way. An interesting add tipical of MFB modules is the buss control, so you don’t have to connect the midi-to-cv interface to send the gate signals to the gate in socket in the envelope module, it uses the buss connection, and I find it really useful. An other useful thing is that every env has 2 cv out, so if the patch is not too complex you don’t need a multiply module. There’s no switch to choose a fast or slow behaviour as in the Doepfer Envelope, but the Dual env is really snappy and has a really fast attack time. For synthetizing percussions and especially Kick drums this env is top! It can get rounded kicks but also hard edge sounds. Using the HOLD can lead to interesting results programming drum sounds. With the hold we can create a “slightly compressed” kick with a fast decay, so the sound get fatter and the peak is less accentuated. Programming bass sound it can result both smooth or percussive. Using the linear mode for the filter env the result is a percussive “angular” bass , while using both exp the sound plays smoother. All in all this module is quite cheap (98 euros in EU) , works really well and has its own carachter. For me is a really good buy! This is my first post and I want to start with something different from other “synth blogs”. 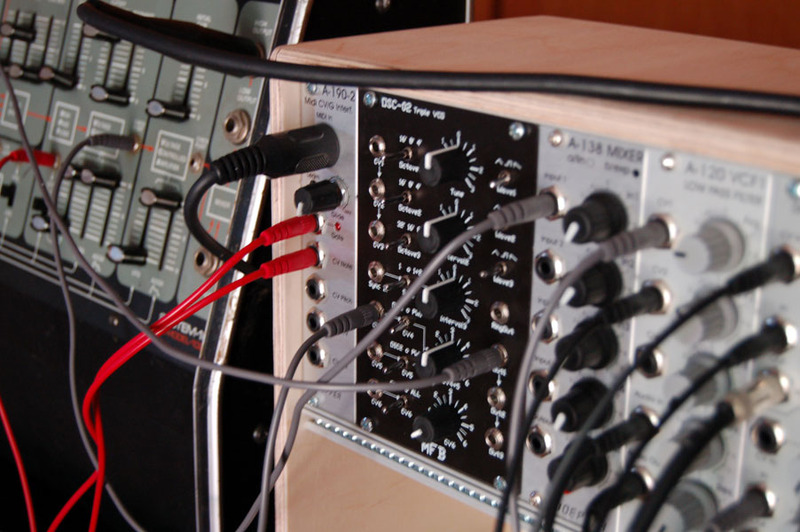 Going modular is really a new strange experience, and it’s hard to describe the reasons why someone choose to start with a modular synth. It may be our fascination for old sci-fi movies, the old photos of electronic /concrete music studios or just the wish to have a different approach to music creation/production in a far more personal way than using the ever boring presets of modern synths. My first approach with the “semi-modudular” synth was when I bought my Korg MS-10, a really cheap and powerful synth in the early 90’s (that I swapped for its bigger brother MS-20). After some years trying to get a real powerful semi-modular (ARP 2600 or a Roland System100) , I had a close encounter with an old Elektor Formant (that had to be restored..) and I decided to give it a try. The Elektor is a DIY project developed in the late 70’s and it aimed to be the “moog for the masses” . The structure was quite similar to the moog modular and even the sound was quite close. I was astonished how good the synth sounded and he could not only be a “efx machine” in the EMS style, it could sound really musical. 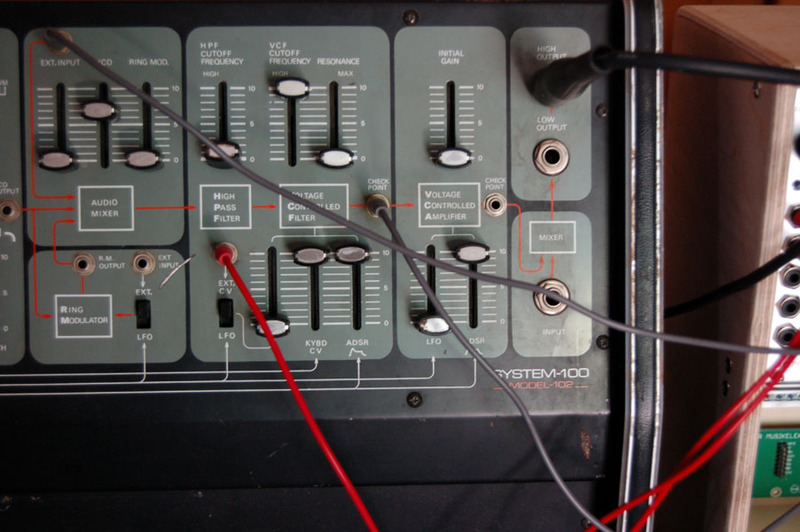 The downside of the Elektor was that it was quite difficult to manage as a “straight synth” for leads and basses as tunung stability was not so good. After some months I decided to sell it to get a more useful synth. I started with a 2 row Doepfer LC case and a small amount of module to get the thing quite cheap and simple but at the same time quite versatile and powerful to enter the eurorack world. More or less it looks like a standard synth , but the modular capabilities make it really a powerful soundesign machine even if the modules are quite standard and not a wall of knobs. I will examinate deeper module by module the whole system and I will post demos. For now I can say it’s a good soundesign machine but even a really good “straight synth” that resambles quite well the carachter of the old japanese beasts like the Korg MS, Roland SH and Yamaha CS.